LA JOLLA, CA—La Jolla Institute Professor Dr. Alessandro Sette has been awarded a $340,000 grant by The Michael J. Fox Foundation for Parkinson’s Research (MJFF) to follow up on an earlier MJFF-supported study, which provided the strongest evidence to date that autoimmunity plays a role in Parkinson’s disease. Part of the new study, a collaborative effort that brings together immunologists, Parkinson’s clinicians and neuroscientists at the La Jolla Institute (LJI), UC San Diego, Rush University Medical Center and Columbia University Medical School, will focus on the in-depth characterization of T cells that recognize fragments of alpha-synuclein, a protein that accumulates in the brain cells of people with Parkinson’s disease. Parkinson’s gradually destroys dopamine-producing neurons, causing the hallmark tremors and difficulty moving. The prevailing wisdom has been that these neurons die from a toxic reaction to alpha-synuclein deposits. However, Parkinson’s has been linked to some gene variants that affect how the immune system works, leading to an alternative theory that alpha-synuclein causes Parkinson’s by triggering the immune system to attack the brain. 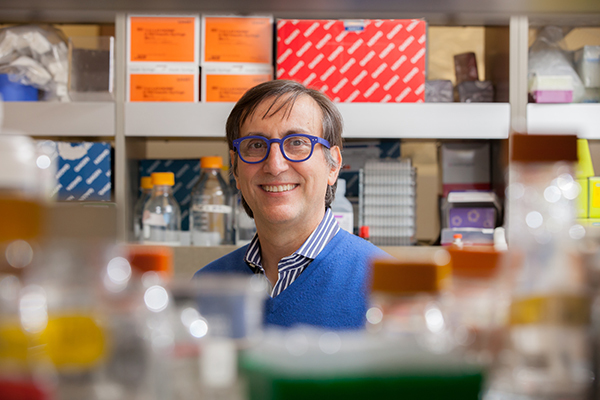 A strong argument against this theory had been the belief by many scientists that brain cells were protected from autoimmune attacks until Sette, and his collaborator David Sulzer, Ph.D., Professor of Neurobiology at Columbia University Medical School, showed that two fragments of alpha-synuclein, can activate the T cells involved in autoimmune attacks. Now, the scientists will expand on their initial study by investigating the regulatory mechanisms underlying inflammatory and pathogenic effects, identifying new targets recognized by autoimmune T cells involved in Parkinson’s, and characterizing the T cell receptor repertoire associated with the disease. Parkinson’s is the second most common age-related neurodegenerative disorder after Alzheimer’s disease. An estimated 7 million to 10 million people worldwide have Parkinson’s disease, which affects neurons in a region of the brain called the substantia nigra. Since substantia nigra neurons modulate muscle movement, patients suffer progressive loss of motor coordination and develop tremors. Many of the affected neurons signal via the neurotransmitter dopamine; thus traditional therapy continues to rely on dopamine replacement therapy. This approach alleviates symptoms, but does not halt disease progression. Currently, there is no cure for Parkinson’s disease. The La Jolla Institute for Immunology is dedicated to understanding the intricacies and power of the immune system so that we may apply that knowledge to promote human health and prevent a wide range of diseases. Since its founding in 1988 as an independent, nonprofit research organization, the Institute has made numerous advances leading toward its goal: life without disease. As the world’s largest nonprofit funder of Parkinson’s research, The Michael J. Fox Foundation is dedicated to accelerating a cure for Parkinson’s disease and improved therapies for those living with the condition today. The Foundation pursues its goals through an aggressively funded, highly targeted research program coupled with active global engagement of scientists, Parkinson’s patients, business leaders, clinical trial participants, donors and volunteers. In addition to funding more than $750 million in research to date, the Foundation has fundamentally altered the trajectory of progress toward a cure. Operating at the hub of worldwide Parkinson’s research, the Foundation forges groundbreaking collaborations with industry leaders, academic scientists and government research funders; increases the flow of participants into Parkinson’s disease clinical trials with its online tool, Fox Trial Finder; promotes Parkinson’s awareness through high-profile advocacy, events and outreach; and coordinates the grassroots involvement of thousands of Team Fox members around the world. For more information, visit us on the Web, Facebook, Twitter, and LinkedIn.